We podcast and stream Magic: The Gathering. We stream our shows live on Thursday nights starting at about 5:00 MST on twitch.tv. The audio version of the podcast is released via rss and iTunes. 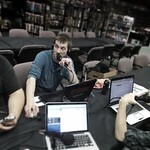 Video of the podcast and video of our live stream games are published to YouTube. Find us all over the interwebs.